Knitting has always been a spiritual experience for me. There's something incredibly calming and meditative about it. Now, if you met me, you will know that I am not the hippy, meditative type. You would probably know that I love Jesus and that I have a strong faith, but you would not put me down as a meditating yoga-bunny who drinks herbal tea and speaks in soft, drawn out tones. I'm usually surrounded by chaos, am bright and chipper and love living an active, fast paced life. Which is why knitting has become a bit of a meditative ritual. Knitting allows me to stop, empty my mind of all the chaos, sit still for a substantial amount of time and focus. As I wrap, push and pull the yarn, over and over again, I slow down and my mind is cleared of everything else, allowing me to focus in on every tiny stitch which will eventually combine to create something bigger and beautiful. And then I find myself praying through every stitch. 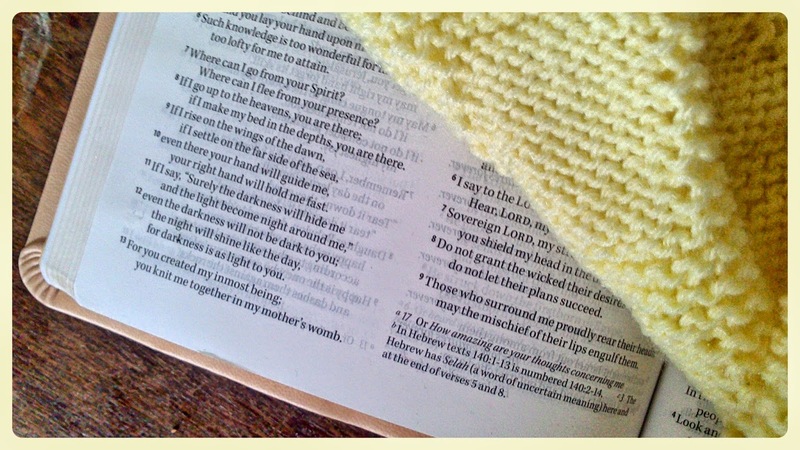 Maybe I'm making a baby blanket and each stitch carries a prayer for the recipient. Maybe I'm just enjoying the process and each stitch carries a prayer for myself as I cease to think about my problems and start to pray through them. After half an hour or so, it is amazing how much clearer the world seems and how much better I feel. My life has felt a bit chaotic of late. We've had notice on our house which means we're moving again for the fourth time in four years. We've had a family bereavement. We've been under financial strain. Work has been full-on. Just life stuff. But as I stitch and think and pray, I am encouraged that God is in my tomorrow, He knows where we are headed, none of this has come as a surprise to Him. He knows and He cares, and there is nothing that is too big for Him to handle, even when it all feels a bit too much for us!